OC Enemies: Omega Ruby, Alpha Sapphire, Delta Emerald, Queen Ophiuchus, Monsters: Climakami. Other Precure Enemies(Monster of the week types): Yokubaru, Zetsuborg, Saiark, Jikochuu, Akanbe, Negatone, Desertrian, Nakewameke, Hoshina, Kowaina, Uzaina, and Zakenna, and Bibury from KiraKira Pretty Cure A La Mode. Unaffiliated Characters: Aether Foundation: Aether President Lusamine, Faba, Aether Foundation Employees. History of the Galactic Guardians: We all know the story of the Silver Millennium and the Moon Kingdom. How it was devastated by an attack by the kingdom of Earth and fell. We also know how the Solar System Sailor Guardians were resurrected. However, what if that was only part of the story? Two years before Galactic Guardians, all the Galactic Guardians were awakened for future threats. All of the Galactic Guardians have had their powers for two years. The Solaris Court, The Galactic Enforcers and Misty are at the Crystal Level(Super). 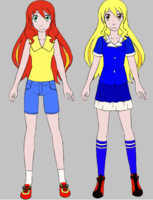 while Ash/Ashley is at the Eternal Level and is also known as Princess Solaria of the Solar Kingdom based on the Solaris Space Colony. Zodiac Precure History: Long ago in a far away land there was the Fairy Kingdom of Climatopia. It was a peaceful land where all the Weather Patterns on Earth originated. For a long time, the land thrived. There was the King and Queen of Climatopia that had two beautiful daughters, Princess Amaya Hikari Amaterasu of Climatopia and Princess Arina Luna Amaterasu of Climatopia. Along with the king, queen, and Princesses there lived three female Fairies. Kaze-the green sparrow Fairy of Wind, Umi-the blue seagull of water, and Nari-the pink robin of lightning. They also lived double, no triple lives of human citizens of Climatopia, and Zodiac Precure along with the Princesses. The Princesses and Fairies have the mantles of the following Cures: Cure Aries(Amaya), Cure Virgo(Arina), Cure Taurus(Kaze/Kazumi), Cure Sagittarius(Umi/Narumi), and Cure Gemini(Nari/Kaminari). In Climatopia, peace reigned for a long time, until one day Queen Ophiuchus and her Eclipse Kingdom attacked. The time period of peace abruptly ended. Little is known about how long peace reigned, but on a beautiful day all was lost and Princess Arina was captured and corrupted and became the second in command of the Eclipse Kingdom. She also became known as Cure Eclipse Virgo. The four Cures fought valiantly but failed in the end. This all happened four years before RP Time. Two years before RP time, the Zodiac Precure Team grew by four members. Akiko Denkou/Cure Leo, now age sixteen the Cure of Lightning, Chisame Genshuku/Cure Libra, also now age sixteen Cure of Gravity. Kasumi Yawa/Cure Aquarius age sixteen, Cure of Water, and finally Sayomi Suna/Cure Scorpio also age sixteen Cure of sand. Amaya/Cure Aries is the Cure of Weather, and Arina/Cure Virgo is the Cure of Earth and grass. The Fairy Cures are as follows: Kaze/Kazumi/Cure Taurus age seventeen in human form, Cure of Strength/Wind/Steel; Umi/Narumi/Cure Sagittarius age sixteen in human form: Cure of Ice and Archery; Nari/Kaminari/Cure Gemini: Cure of Mimicry(just her own Cure Team and select few other). Eventually, in fact about four months and two weeks before RP Time, two massive battles were held. One was between the Zodiac Precure Members of Cure Aries, Cure Gemini, Cure Sagittarius, Cure Taurus & Cure Cancer; and the Eclipse Kingdom's Cure Eclipse Virgo. The battle raged on until Cure Eclipse Virgo was eventually defeated and Cleansed and rejoined her teammates of the Zodiac Precure Team. It was also revealed that Cure Cancer was indeed the third Princess of the Climatopian Royalty. Her name was Princess Izumi Celestia Amaterasu of Climatopia also known as Izumi Haruko. After the end of the Climatopian Battle, Cures Aries, Cancer, Gemini, Sagittarius, and Taurus now joined by Cure Virgo returned to Earth to defeat the remaining monsters that were attacking Aurakako joined bye Hoshiko Kita/Cure Capricorn and the rest of the Zodiac Team. About a month later, the eleven members of the Zodiac Precure Team met up with Cure Pisces also known as Tammy, who eventually joined them. Once the 12 Zodiac Cures were united, they went through a three month trial and earned Zodiac Crystals and new Transformation Devices. All of the transformation devices were now the same, as was their Transformation Phrase. With a shout of Let's sparkle, Precure Zodiac Shine! Twelve Teenage Girls, well nine Teenage Girls and three Zodiac Fairies who each have a Teenage Girl form transform into the formidable fighting force known as Zodiac Precure. Shortly after the upgrades to the Zodiac Precure Teams, Cure Pisces went into hiding again. Little is known about the mysterious Cure Pisces, the Zodiac Cure of Nature and Change, but you can bet that there is a chance that she will return. Izumi Amaterasu-Haruko/Cure Cancer is a naive fourteen year old girl who just recently found out that she was not only the youngest of three Climatopian Princesses, but a Precure to boot. She is the Cure of the Moon. Izumi was Cure Cancer all along, but she didn't join in the fights against the Eclipse Kingdom until the battle between Cure Eclipse Virgo and the Zodiac Team. Hoshiko Kita/Cure Capricorn is a seventeen year old girl who also happens to be Izumi/Cure Cancer's best friend. She became the Zodiac Cure of the Sun at the same time as Akiko and her friends did, but didn't join in the battle as Cure Capricorn until recently. She too fought as Cure Capricorn during the Cure Eclipse Virgo battle, but not in any of the battles before. As for Tammy/Cure Pisces,the only things known about her are that she is the Zodiac Cure of Nature and Change and is also seventeen years old. She was with the rest of the Zodiac Team during the Zodiac Crystal trials and received a Z-Cator and an upgrade as well. 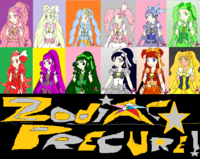 The time has come for the Zodiac Team, Galactic Guardians(Solaris Court Division), Planetary Senshi, among others to come together to stop the threat of the Eclipse Kingdom as well as Returning Dark Kingdom. Settings: All Precure Towns, All Pokemon Regions, Juban, Fan Series Locations. Category: Pokemon/Sailor Moon/Precure Crossover among others. Characters accepted: All Canon, Crossover, and Fan-made Characters. Rules for this RP will follow shortly. Misty Kasumi Waterflower, Ashley Satoko Ketchum, a Pikachu with a Crescent Moon Mark on his forehead, May Haruka Maple, Casey Nanako, Duplica Imite, and Darcy Shuu known as the Solar Kingdom Sailor Guardians, more specifically the Solaris Court division took their seats at a really long table. This group was the first of many that would be arriving soon. Misty: "Um what's going on here? We got a distress call on our Portal-Coms, answered it and we ended up appearing out of a portal here." Ashley: "I would like to know the same thing. I was planning my latest Pokemon Journey traveling with all my friends. What is the meaning of this?" 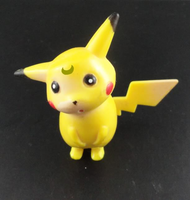 Orion: *Crescent Mark disappears* "Pika Pika?" May: "Someone better start explaining fast! You made me miss one of my favorite meals at home!" Duplica: "Why did we end up here? I'm so confused." Darcy: "You do realize that I was preparing for a Pokemon Contest don't you?" As the Galactic Guardians Division known as the Solaris Court was awaiting an answer, several more distress signals went out to the various Precure Cities as well as the Juban District. A Distress signal even ended up being sent to the United States and throughout the rest of the Multi-Verse for some reason. What was going on? In the Zodiac Hall, a girl with long strawberry blonde hair was looking at her watch. Then, she turned to look at the very empty (bar a few people) hall, and pouted. "Geez, shouldn't everyone be here by now?" She complained, starting to get impatient. This was urgent, yet people were taking their time on arriving. How annoying. "Hoshiko, calm down. They'll be here soon, I know it." A gentle voice said, and this voice belonged to a visably younger girl, with black hair tied into a side-ponytail. Meanwhile, in a small town far away, four girls were sitting on the edge of a water fountain. "Hotaru, how many more if those cakes are you planning on eating?" A girl with light brown hair asked, while a ginger haired girl ate cakes. "I'll eat as many as I want!" Hotaru remarked, still eating them. "And you're not going to share?" A blond girl asked, doing puppy eyes. "Keiko..." Suddenly, Hotaru's Sun Phone, Satomi's Music Phone, Manami's Moon Phone, and Keiko's Lucky Pen to shine. Manami looked at her phone confused, but turned it on, with Hotaru and Satomi following her lead. Keiko pressed a button on her pen. Suddenly, the four, along with their fairy partners, were transported to the Zodiac Hall. Makoto Kino arrived at the zodiac Hall again and was still amazed at the place. She thought she smelled food but didn't worry about that right now as she walked into the main hall. She then saw the others and yelled, "Hello everyone...Makoto is here to help...How many do we have so far coming?" She walked over and sat down facing the others. After she sat down she noticed Ashley and Orion..."ASHLEY!! ORION!!" She got up running to them and hugging her then bent down to pet Orion..."Look at you cute thing you Orion...Wow Ashley you keep him in such great condition...heck I'm even wanting a Pokemon now too.." She looked around again and said, "Wow you brought the whole crew...HI girls!!!" Nari, Umi, and Kaze, now in their human forms: looked toward Hoshiko as Kazumi sighed and spoke up. Kazumi: "They will get here when they get here. We just have to be patient Hoshi-Chan. The computer picked up an anomaly in the Arctic and detected energy being sent their from all over the world, at least from the regions that have something called Pokemon in it, as well as several of the towns that our fellow Cures are." Kaminari: "The computer felt a Universal Distress Beacon needed to be sent out, so it did. We will just have to wait and see who all shows up in addition to the group that just arrived here." Narumi: "We are going to need all the help we can get if the readings from the computer are anything to go by." May: "The Arctic, isn't that where Beryl was based four years ago, and again two years ago? I have a really bad feeling about this. We are going to need a lot of help." Casey: "Agreed. It also looks like all the teams that you encountered in your past adventures have surfaced again Ashe." Duplica: "Hey wait a minute, does that mean Team Rocket wasn't disbanded after all?" Darcy: *Pulls out her Rhea Computer and gasps. * "My computer and the mainframe in here are picking up the same signatures. Energy is coming from all over the world and being directed to the same coordinates as when we faced Beryl, before that Usagi and her friends faced Beryl there as well." Akiko: "That really doesn't bode well. It looks like that energy is also coming from some of our senior Cure Teams' hometowns. All of them!" Misty: "Oh great, not only is Team Rocket back, but Aqua, Magma, Galactic, Plasma, Flare, Skull and some unknown company known as Aether? Ashe, do you know what the two computers are saying?" Ashley: "Whatever it is, it's not good." The rest of the Zodiac Team agreed with Akiko. It was going to take more than the people that were here to combat this threat. Galactic Guardians and Orion: "More people?! What's going on here? Akiko then notices that the Crystal Precure Rainbow Team arrived. Akiko: "Good, the second group showed up. I really hope they aren't the last ones to show up. With the appearance of four more young ladies around their ages along with some creatures that resembled stuffed animals from from another portal, the Zodiac Team's fears were realized as Kazumi and the others rushed over to greet the stuffed animals that were being held by four girls after they returned to their Fairy forms and happily greeted them. Zodiac Fairies: "Dreami, Pretti, Snowi, Lucki! It's been a while hasn't it?" OOC: Tag 🌸Cure🌸Yell🌸 Also, yes 🌸Cure🌸Yell🌸 that's what I meant by Distress Call. Ashley and Orion: *Hug Makoto back* *Orion let's off a Content Pika as he is petted and praised. 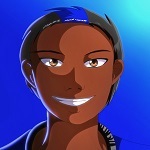 OOC: darksportsnutd and anyone else. Makoto smiled at them as they surrounded her and hugged each of them. Suddenly another person pooped in and looked around... "WOW this place is beautiful and everything but where am I exactly...I don't see Stephen around anywhere and I know I was with him..." She walked in more yelling, "HELLO?? Is anyone here??" In the doorway of the Zodiac Hall, a golden symbol-engraved shutter appeared, opening to reveal a portal, and someone coming out of it. It was a black human male, 6' 4" with short black hair with a blue vertical streak, brown eyes, having a tall medium athletic build. He was wearing modern casual clothes, carrying a blue and silver backpack, and sporting a unique & elaborate gold bracer with a dark blue round jewel. He soared through the portal and curled into a ball as he hit the ground, bouncing using some kind of force field that protected him from the impact, as he eventually came to a sliding halt in the Hall. He looked up and around, immediately eyeing two of them. "Makoto Kino?!" he exclaimed. "Stephen Dareau?! Is that really you guys? By the way, where are we?" Makoto looked back and saw her Vance... "VANCE!!!" She ran to him pretty much tackling him and kissed him. She then helped him up saying, "Stephen is not here for some reason I was with him earlier and I hope he doesn't think I ditched him. "No I don't think you ditched me Makoto..." A voice said as Stephen walked over to them... "YO VANCE!! Whats up partner in crime..."
Vance held Makoto up by her legs, kissing her back. "I can't believe you're here...wherever here is..." Then he set Makoto down to go and see Stephen. "Long time no see, soldier." he said. "So how did it go since you last got back to Earth?" Makoto loved being around Vance but with their schedules taking them different places it was hard to get together.. Makoto watched happily as Vance went over to Stephen. Stephen saluted Vance and told him, "Well it has been good...Amelia and I are getting a house soon and we are thinking of adding a addition to our family if you know what I mean. Anyway I missed you so much man...ever since..you know...that battle...I really don't think we should even think of that one right now...though we need to figure out this place...is there anyone else here other then you and your girlfriend...also..when you getting married...huh?" The Solaris Court sees Vance and Stephen and have a calculating look in their eyes. Ashley and Duplica: "You two seem familiar to us as well. Why do we feel like we know you?" Orion: *Manifests his Crescent Moon Mark* "You two do seem awfully familiar. I can't help but feel like we've met before." Misty and May: "Same here. Why are you so familiar to us?" Casey: "I don't know, somehow he looks familiar to me as well." Akiko: "So I wonder if anyone else will show up. Welcome to Zodiac Hall everyone, my name is Akiko Denkou I'm the leader of the Zodiac Precure Team. Welcome to Zodiac Hall. Please everybody take a seat." Kazumi(The girl with the big green Twintails): "My name is Kazumi Denkou, but you can just call me Kaze. Our computer picked up an anomaly from somewhere in the Arctic. Although, energy seemed to be coming from all over the world, including from all the Pokemon Regions in this World. We really aren't sure what it was, however, it triggered a Distress Beacon that went all over the World as well as the Multi-Verse, whatever that is. Where you are is in Zodiac Hall." Kaminari(Girl with long free-flowing pink hair with the red ribbon in it): Zodiac Hall is an extra-dimensional area outside Earth and the other dimensions. This is the Zodiac Precure's base of operations. By the way, my name is Kaminari Denkou, but you can just call me Nari." Narumi(The girl with the blue hair with the blue and white Polka-Dot Ribbon): "My name is Narumi Denkou. My friends and I will tell you more about ourselves in a bit. Everyone calls me Umi for short. Please, like Akiko said, everyone sit down." OOC: Anyone in Zodiac Hall. With each new arrival a new chair is added to the table and the table gets a bit longer. Once again, tag anyone. Stephen looked at the girls when they came over and then was staring at them like a Breath of the wild flashback scene...when he came to he said, "Im not sure either and most times I never forget a face but you all...im forgetting....im sorry"
"Of course I remember it..." Vance replied. "And I'm glad you're doing alright, and I'm especially glad that you found your sweetheart. As for me and mine, no plans of the wedding yet, but we are enjoying each. Vance saw the Zodiac Court come in, looking to them as they mentioned that they recognized them. "While I can't place any faces besides Makoto and Stephen," Vance began. "I did receive a Distress Signal, which is why I'm here. I'm Vance Brice, codename Psyral. I head a team called the Xtreme Regime, you could call us magical freedom fighters, because we got our start by defeating a legion that raided the solar system of Fanza and was nearly successful. I was called to help them, though I had no experience in magic or powers, and I trained with them until I was ready to fight with them, and fight with them I did. Nowadays, I explore other worlds and dimensions to get even more experience and grow my abilities with my magic, the MetaForce." He then held up his right hand, bending all but his index & pinkie fingers and thumb. A magic-casting circle showing three points where the fingers were showed before his hand. "In addition to training myself, I'm also looking for allies and friends to join up with." Vance said. "And it looks like I'm in an ideal place to do that." Three girls suddenly appeared in the hall after being teleported. One had long auburn hair, one had pink hair, and one had twintails. "What happened?" asked the girl with pink hair. The girl with long auburn hair stood up. "This is crazy!!" she yelled. "We got a distress call on our EleForms, answered it, and now...we're here?" "Daisy, calm down." the girl with twintails said. "This is kinda weird though..."
"See? Yumeko, you agree with me, don't you?" Daisy asked the girl with twintails. "Daisy-san, Yumeko-san, calm down." said the last girl, the girl with pink hair. "All right." said Daisy. She sat down and sighed. "What is going on...?"